Find the Right Pillow for You! When you wake up from a good night’s sleep, sometimes this feeling maps out your whole day. When you wake up feeling refreshed and ready for the day, this can put you in a positive mood and help you excel on the tasks ahead of you. When you wake up from terrible rest you may appear grumpy, irritable, and really just want to go back to bed. Getting up groggy can hinder you from daily activities and keep you in a negative mood throughout the day. At Mattress for LESS in Newington, we want to make sure you are always getting the best night of rest possible. That’s why we sell some of the most comfortable mattresses and pillows on the market. Our staff is knowledgeable and will know how to find you the mattress and pillows that are right for your sleeping type. 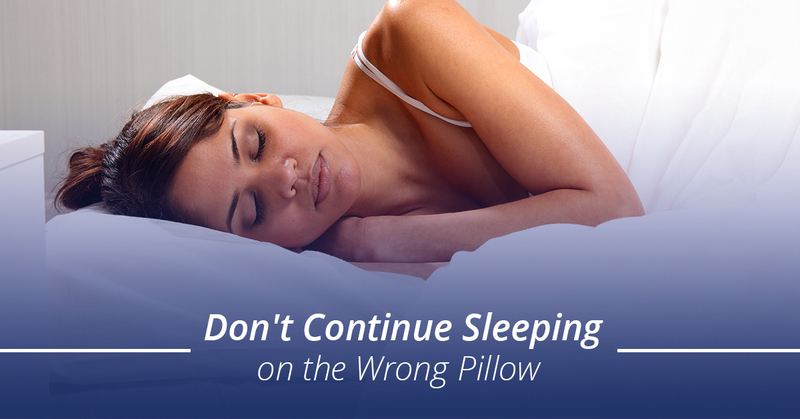 The purpose of the pillow is to keep your neck and head aligned as you get a good night’s sleep. Many people believe that they can just squeeze a pillow in a store, or lay down quickly on one as well. Unfortunately, it takes about 20 mins for your body to get acclimated to a pillow underneath your head. Finding the right pillow is not as easy as it looks, and we at Mattress for LESS want to help you the best way we know how. If you know you prominently are sleeping on your side, possibly curled into a ball, you are not alone. This is actually the most common sleep position. For you to feel comfortable and get the rest you need your pillow needs to be on the extra firm side. This is so the pillow is able to align your neck properly. A great option for you would be a memory foam pillow that can contour to the curve of your neck and head. A pillow that flattens out is going to be your enemy since you need the proper support since you are on your side. People who tend to sleep on their back need to have a pillow that has medium firmness. The pillow can be a down, memory foam, or latex foam, but it needs to have a medium height as well. When people sleep on the back this is when they tend to snore most often, which can lead to other serious issues. One thing to remember, if you have someone who snores, is that their head needs to be propped up with at least two pillows. While the other two positions require you to have a decently firm pillow if you are stomach sleeper you need quite the opposite. When you roll over in your sleep, you tend to bring yourself very close to your mattress. You want a pillow that is going to curve to your neck but not keep it stiff at the same time. A down pillow or thin foam pillow can help keep your necks curve and give you the comfort you have been searching for. As you can see, your sleep position is important for your sleep comfort. Find the right one for you at the best mattress store in Newington. Call us with questions or concerns and we hope to see you soon!